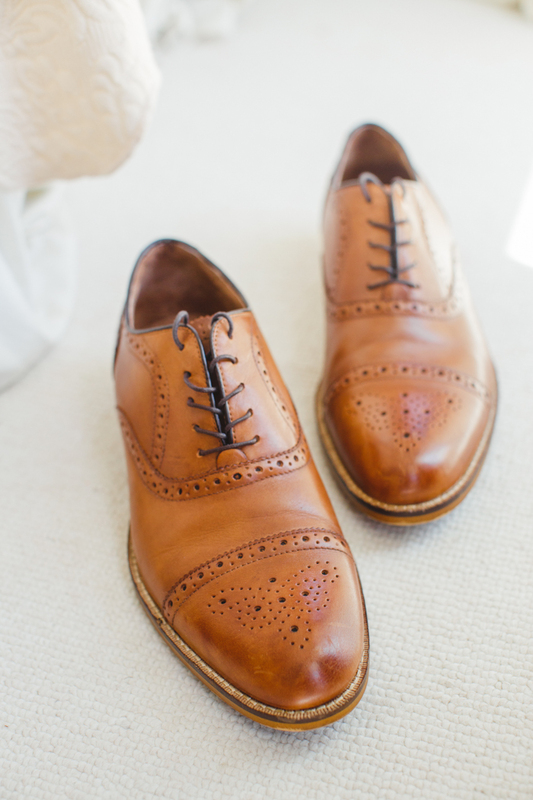 Hilton Head South Carolina Wedding. Chicago cuties Kaite and Brian wanted to head south for their wedding day and planned a destination wedding in Hilton Head, South Carolina. 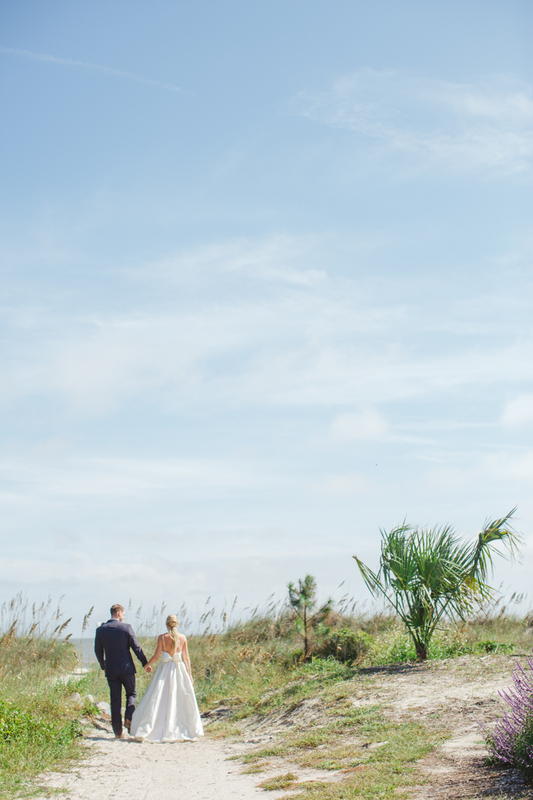 Kaite dreamed of a beachside wedding and that was made a reality thanks to her craftiness with decor and design. Unbeknownst to the couple, the Blood Moon caused the tide to rise to an uncommon level; however, they braved the elements and still enjoyed a truly romantic celebration. Kaite designed the wedding invitations and signage. 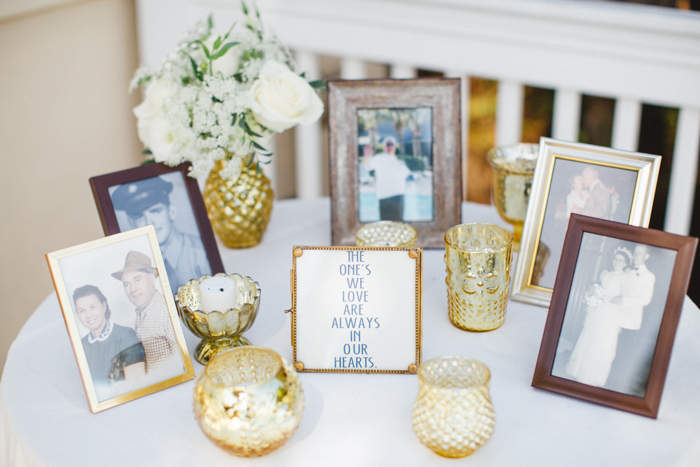 The creative collection wonderfully depicted a destination wedding and gave guests a glimpse into the fun to come. The bride also designed her gown. The modern empire waist creation came from Kaite’s own vision and was tailored to fit her just right. Her bridesmaids looked lovely in long blush infinity-style dresses alternating in solid and lace patterns that complemented the white and blush florals. Brian and his groomsmen looked cool and collected. 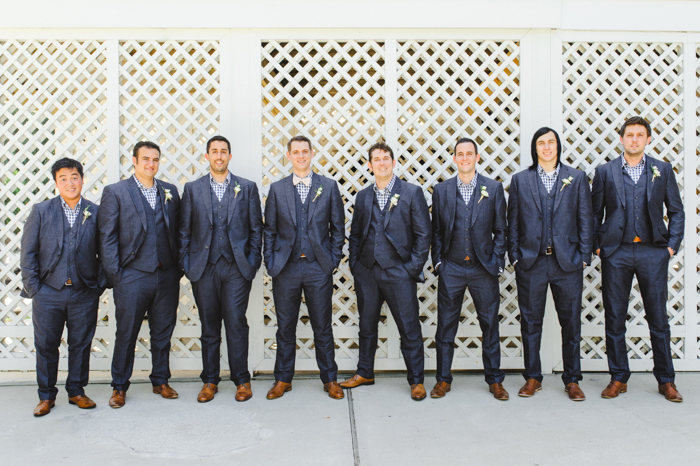 Navy blue suits with gingham shirts were the outfit of choice; however, as the groom, Brian wore a white bow tie. The sky was perfect as the two met for a first look moment before the ceremony. Kaite’s long veil danced in the breeze as her and her soon-to-be-husband walked hand in hand towards the shore. An adorable flower girl held an all-important sign as the ceremony began. In front of the roaring waves, the two said “I do” in front of family and friends. 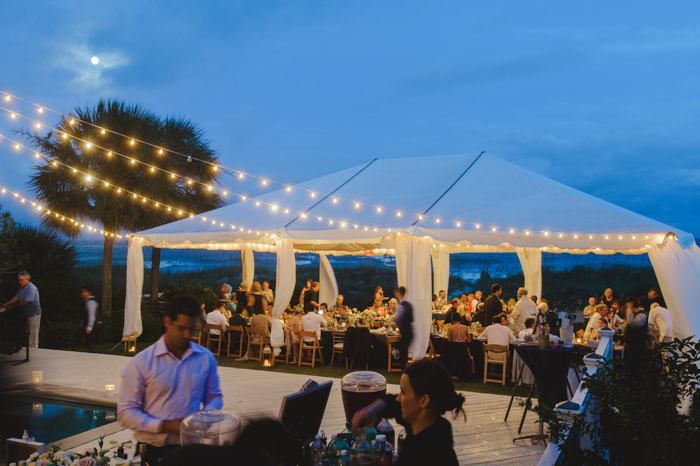 The event took place at a private rental home on the island, and guests first noticed the reception featured string lights hanging above a luxurious pool. Everyone was greeted with a chalkboard seating chart and memorial table. 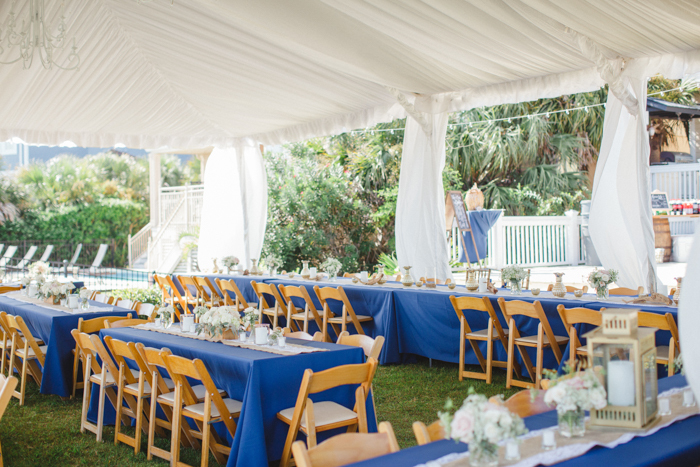 Outside under a white tent, rows of navy-covered tables were presented with lace and burlap runners, flower arrangements in wooden planter boxes, and gold lanterns. Seats for the bride and groom were designated with a gold ampersands that held the two chairs together with blue ribbon. The cake was a darling three-tier creation with crisp white layers and small fondant bow accents. It was a stand-out piece on the blue table. As the sun began to set, Brian and Kaite rushed out to the beach for photos. With the sky turning from blue to purple to black, they embraced and cherished the intimate moment as husband and wife before returning to the reception. The group had a blast celebrating the bride and groom. The couple provided props to take fun photos and selfies throughout the party. When the night was through, Brian and Kaite left linked together as friends and family lined up with sparklers. Flying south for their wedding proved to be a sweet success. The unusual changes in the tide didn’t stop them from enjoying a spectacularly fun and romantic wedding – designed straight from the heart.